Liz Whiteman Smith is a full-time printmaker based in London, best known for her colourful screenprints of London buildings, Alice in Wonderland characters, patterned boobies, quirky dinosaurs and her elegant little cacti. She shows her original prints at Espacio Gallery, Bankside Gallery, Southbank Printmakers Gallery and the Affordable Art Fair. For the last four years Liz has been screen printing at Print Club London, a water-based studio, so she works with acrylic paint to which she adds a screenprinting medium. Because she had heard that the new Jackson’s Studio Acrylic Paints were good value for lots of pigment she wanted to see if they would work for her printmaking. Be sure to watch the three short videos showing Liz’s printmaking process and her very impressive registration technique! 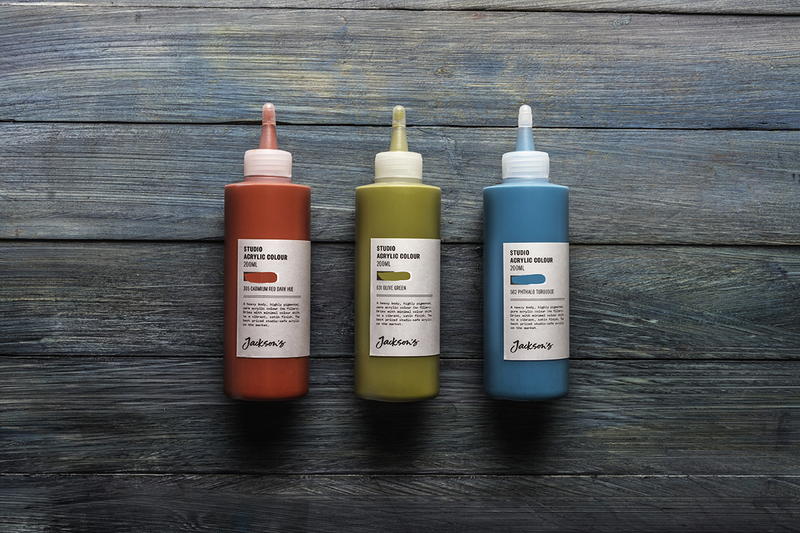 Jackson’s has recently brought out a range of 32 studio acrylics in a range of colours. I have been testing some of them for the last few months to see if they would work for my screenprinting: Cobalt blue hue, Sap Green hue, Cadmium red hue, Cadmium yellow hue and Magenta. This shows that the Jackson’s Studio range is lower in cost than Daler-Rowney’s System 3 range and much less expensive than Liquitex or Golden heavy body. 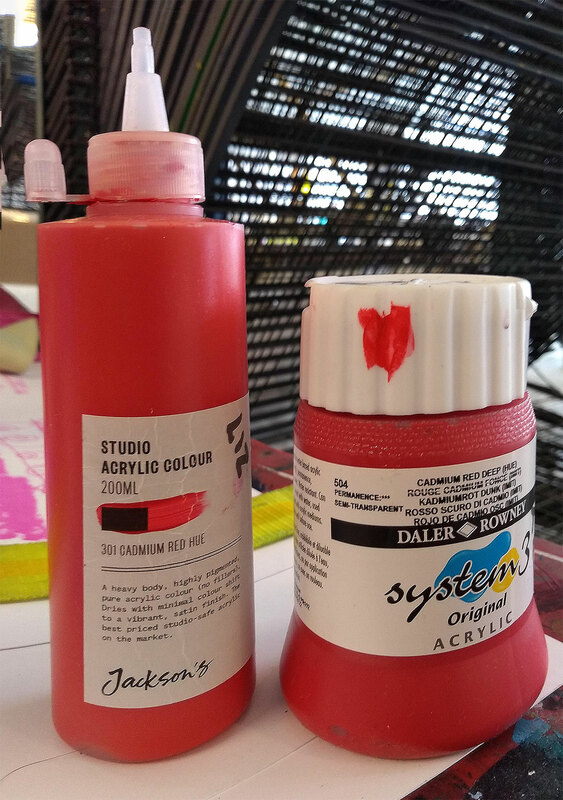 To get a fair comparison I have been comparing Jackson’s Studio range with System 3 acrylic paint, since they are both in the same price bracket and have similar colours with lots of ‘hues’ like the Cadmium Red Hue. Another factor in choosing acrylic paint is the quality of the paint. For a screen printer that means depth of colour and fluidity. The Jackson’s Studio range was very fluid and easy to work with, I didn’t have any issues with particles clogging the screen which causes blank spots in the finished print as I did with the System 3 paint I used in a previous edition. I also tested the strength of the colour. I printed one screen print – Lithops & friends – with two different Magentas. Here you can see the two prints side by side, the print on the left was printed with Jackson’s Magenta and on the right with System 3 Magenta. You can see how much richer and more intense the Jackson’s Magenta is compared with the System 3. I found the viscosity good and I also liked the container that the Jackson’s Studio Acrylic came in, it’s very versatile and easier to store as it’s not too wide. However, when you get to the bottom it’s really hard to get the last bit out. I had to cut the bottle in half to use it all. 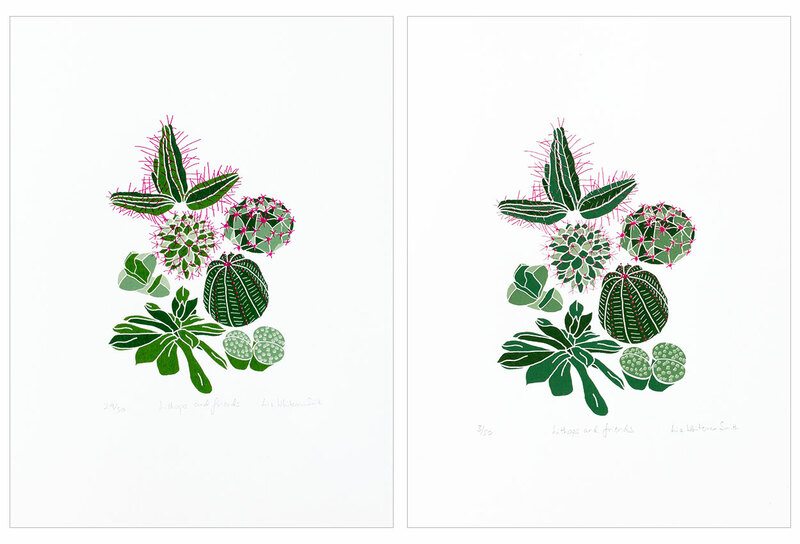 I also used the Sap green and Magenta in the cactus print I did for Print Club London’s ‘Choose Love’ charity campaign. This needed a lot of ink as it is a large print, the ink needed to have good fluidity and intensity of pigment, both the Magenta and the Sap green worked well. 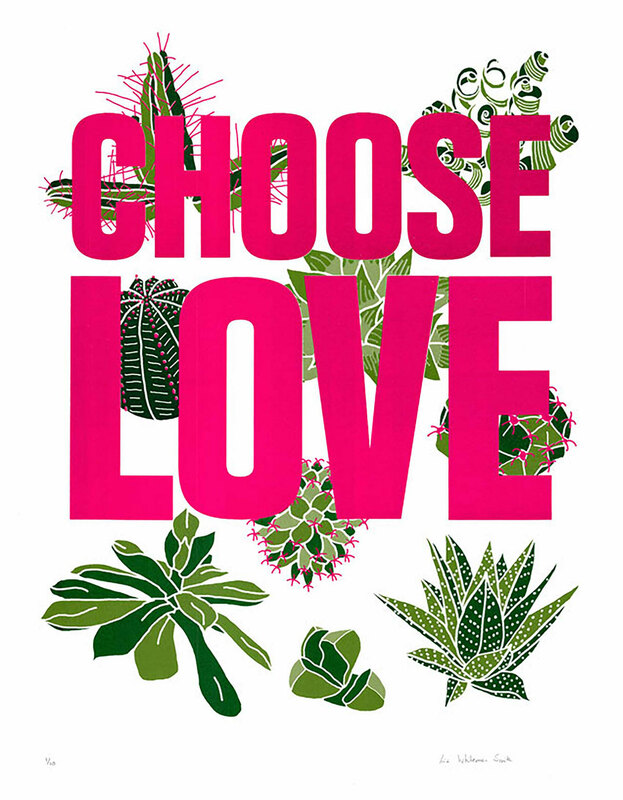 I used the Jackson’s Studio Acrylic Sap green and Magenta for the cactus print I did for Print Club London’s ‘Choose Love’ charity campaign. 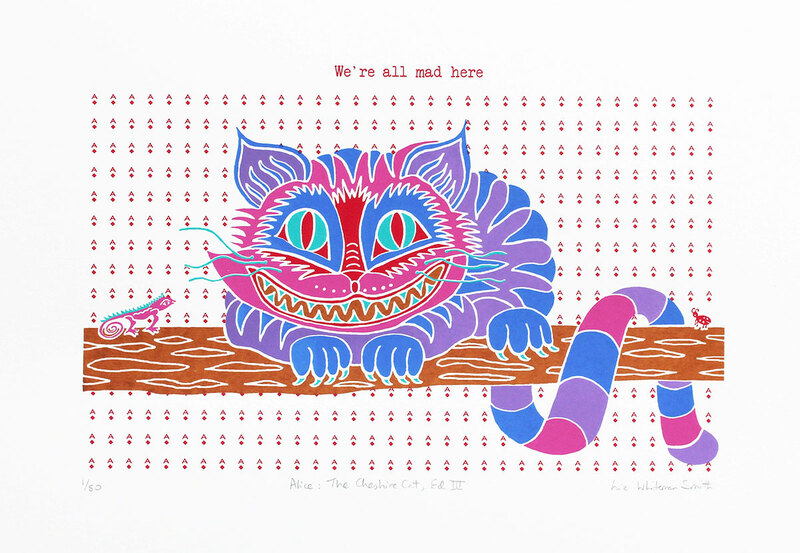 This is the 3rd edition of my popular Cheshire cat print, this time with a round tail and softer colours. I used Jackson’s Cobalt blue hue for the blue layer. 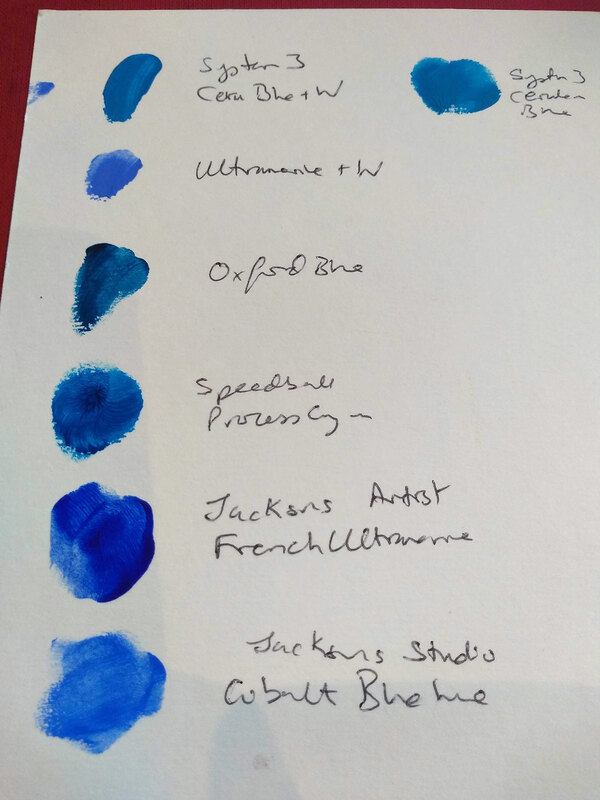 The blue swatch sheet is an example of how I check the different shades of a colour to help me decide which one to use. 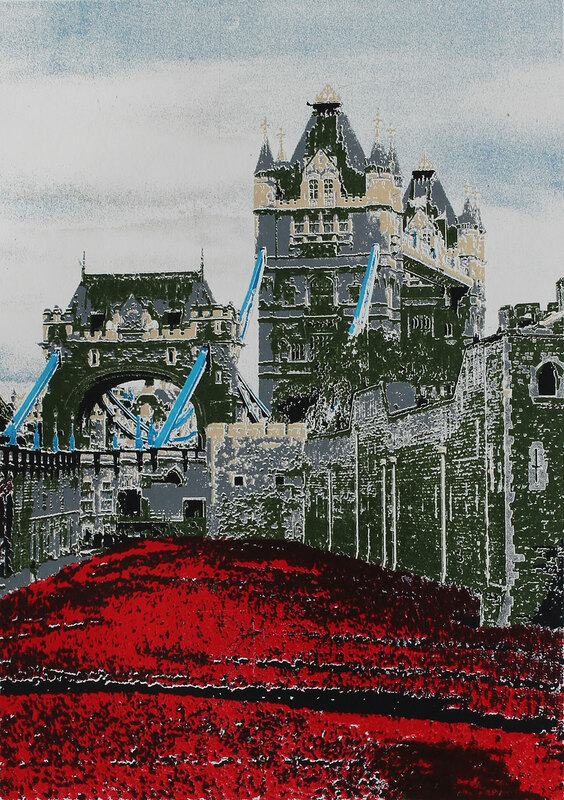 I used Jackson’s Cadmium red hue in my latest screen print Tower Bridge and Poppies in one of the 4 layers of red. This print required a delicate blend of different reds to create an intense depth of colour for the poppies. This print will be shown in my latest exhibition Original Print Fair at Espacio gallery, London 30th October to 11th November 2018. 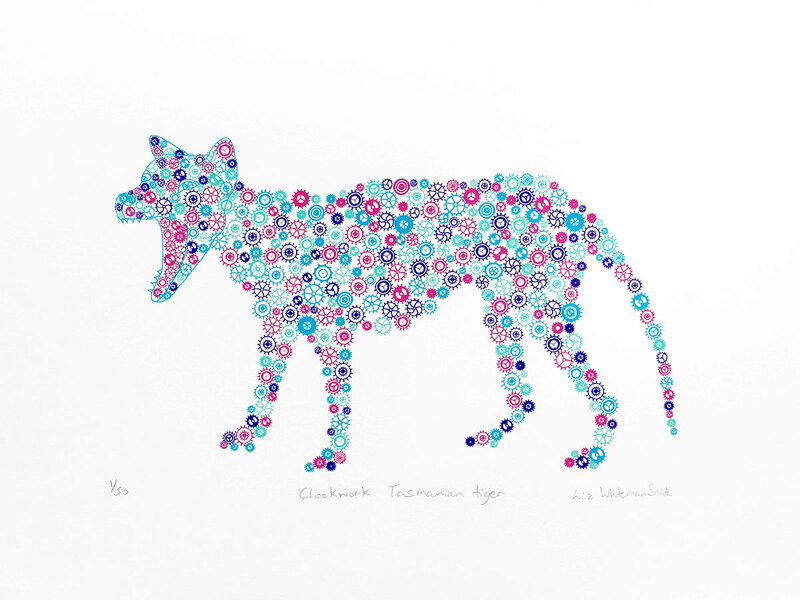 I am also very excited to have had my Clockwork Tasmanian Tiger selected for the prestigious Masters: Screen and stone exhibition at Bankside Gallery, London from 7th to 18th November 2018. All photos and artwork are copyright of the artist. 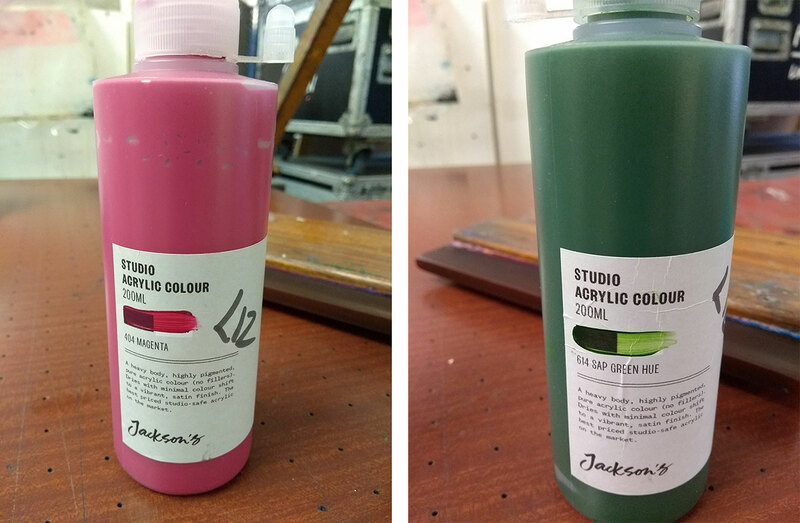 Jackson’s Studio Acrylic Paint is studio-quality acrylic colour available in 32 colours in 200ml & 500ml bottles, including three metallic colours with Titanium White available in a 1000ml bottle.The great value means it is perfect for artists who use a lot of acrylic paint, including printmakers. Take a look at Jackson’s Studio Acrylic Paint on the jacksonsart.com website.